Green sapote is a native of Central America, most probably to Honduras, Guatemala and Costa Rica at elevations between 3,000 and 7,000 ft (900-2,100 in). It is a close relative of mamey sapote which is relatively more popularly grown fruit. The green sapote is, however slightly smaller in size, with green-yellow or brownish skin and an orange-red pulp much like its cousin. Strangely, this fruit is not known much outside of Central America, although many experts rate it superior in flavor to the mamey sapote. The fruits are commonly sold in local markets. A medium to large-sized tree, 13 to 25 m tall. .
A medium to large erect tree, 12-24 m high; young branches densely brown-hairy. It possesses an abundance of white, gummy latex. Leaves clustered at the tips of flowering branches and irregularly alternate along non-fruiting limbs; oblanceolate, pointed, 10-25 cm long, 5-7 cm wide; hairy on the upper midrib and downy-white beneath. Fruit nearly round to ovoid, pointed at the apex and sometimes at the base; 9-12.5 cm long and 6.25-7.5 cm in diameter, with thin, olive-green or yellow-green skin dotted with red-brown and clinging tightly to the flesh; flesh light-russet, of fine texture, melting, fairly juicy and sweet; of better flavor than the sapote. The fruits are usually eaten fresh out of hand, but the pulp is also used in making desserts and preserves. 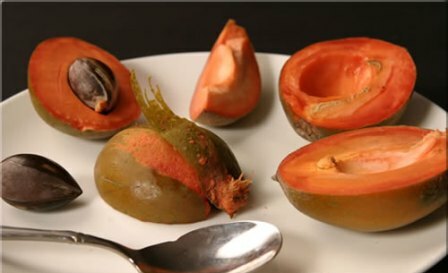 The pulp is softer than the mamey sapote. The seeds are also edible and are often roasted. The latex (chicle) from green sapote trees is also collected on commercial scale and marketed like that from the sapodilla for use in chewing gum. The wood is reddish, fine-grained, compact, strong, durable; occasionally used in construction, carpentry, turnery, and for furniture and paneling in Guatemala. This plant has been observed to be hardier than mamey sapote. Propagation is mostly by seed but plants can also be raised by grafting on mamey sapote seedlings. The grafted plants start bearing much earlier than the seedlings which may take even upto 7-8 years. There is not much information available on the cultural practices for this fruit, but it seems to prefer full sun and also required regular irrigation. The fruits develop slowly and take 9-10 months from flowering to ripening. Fruit is mature with first color break, can be picked hard, and will ripen off the tree.